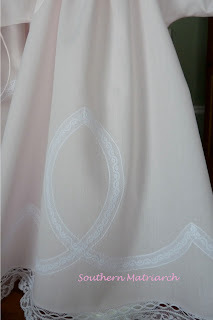 I used Imperial batiste and did lace shaping on the front as opposed to embroidery. I did not cut the fabric out from behind the lace. The hem and sleeve edge are both finished with beading and edging. The pattern called for 1/4" neck binding. After doing 1/8" so much I have come to prefer it, so on the second gown I made it the more narrow bias binding. well these are so precious I can hardly stand it. And are you ever productive!!!! Two gowns and jambalaya too??????? How do you do it?? These are so precious. I think you must be one of the most generous sweet kind ladies I "almost" know. I tear up just thinking about how grateful the parents of these little ones must be to know that there are people like you in the world who care about them even though you don't even know them. 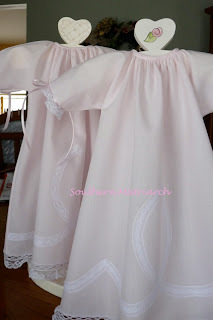 I love everything about the little gowns, the pink, the ribbon, the lace, especially the beading at the bottom. You can tell you made them with love. Thanks for sharing the pictures. 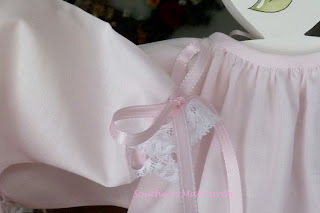 Beautiful little gowns for beautiful little angels, Martha. Your lace shaping is impressive. These gowns are just so beautiful. I would love to make something like that but I am just a beginner. So pretty. Julia, thank you. I have a soft spot for Wee Care. Valerie, this actually would be a very good beginner project. No set in sleeves, very simple lave shaping, no buttonholes. I used ribbon ties in the back. Ohhh sooo beautiful! 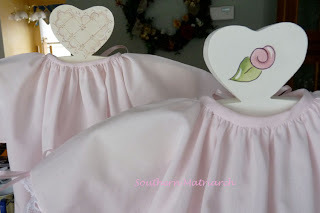 Nothing is more rewarding than making wee care gowns for special babies - it's such a wonderful ministry! Thanks for sharing your precious gowns! This makes my heart flip. 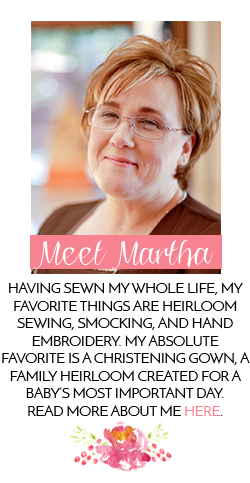 So precious, Martha. 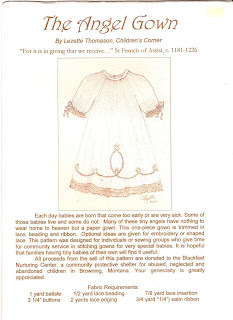 Precious gowns for precious babies made by precious you. Those are beautiful little gowns. 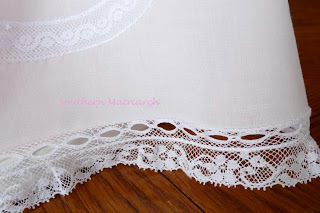 I love the lace shaping too. Wow, you do the detailed sewing! Great work!